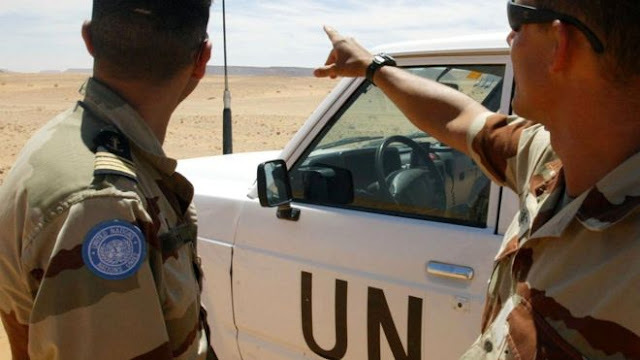 A conflict in the disputed territory of Western Sahara in north-west Africa may flare up again if the UN's peacekeeping mission is not fully restored, an African Union (AU) envoy has warned. The UN brokered a truce between Morocco and the indigenous Saharawi people in 1991, ending a 16-year insurgency. Last month, Morocco expelled 84 UN civilian staff after the UN chief used the term "occupation" about the region. This has hampered the UN mission, whose mandate is up for renewal this month. Morocco has threatened to pull out the soldiers it contributes to UN global peacekeeping missions, mainly in Africa, over the row. "The Western Sahara problem may be seen as a small problem, but let us not forget that a spark may put a forest on fire," the AU's Western Sahara envoy Joaquim Chissano, a former president of Mozambique, told an informal meeting of the UN Security Council. He said he was "dismayed" by the crisis that had erupted after UN Secretary General Ban Ki-moon's visit to the region and criticised Morocco's decision to cut UN staff, the AFP news agency reports. The UN says their departure has made it impossible for the UN mission, known as Minurso, to carry out its mandate. Mr Chissano is the latest official to warn that the expulsions are "dangerous precedent" as other countries with Security Council-mandated peacekeeping and political missions could decide to expel UN troops and staff as well, the Associated Press news agency reports. Mr Ban made his controversial comment while visiting refugee camps in southern Algeria, where more than 160,000 ethnic Sahrawis, the main indigenous group of Western Sahara, live after many fled violence there in the 1970s. Minurso was established 25 years ago after a ceasefire ended a war that broke out when Morocco annexed the former Spanish colony in 1975. It is tasked with organising a referendum on the future of the territory, but this has yet to take place. The informal Security Council meeting took place days before the expiration on 30 April of Minurso's mandate. Morocco is the only African country not to be a member of the AU because the organisation recognises the Polisario Front, the indigenous Saharawi independence movement. The Saharan Arab Democratic Republic (SADR), declared by the Polisario Front in 1976, is a full AU member.